Where Are You Going? 2 years ago Where are you going? Everyone will spend eternity somewhere. Where you spend it is determined by what you do with Jesus Christ. Check out godlife.com to learn more! 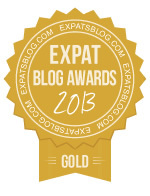 ExpatsBlog.com Expat Blog Awards 2013: Belize Gold Award! This blog has what it takes to win the Expats in Belize Blog Award! Just the best out there by far! Great Photos - insightful commentary plus terrific humor! Must not miss!